► Starting from £35,580 - too pricey? This is the least expensive way into owning an AMG: fact. Mercedes-AMG’s new A35 hot hatch is the new baseline for Affalterbach’s extreme range of performance cars. While the A45 is still to come, the new one is expected to be so powerful that it’ll continue to be compared to little other than the equally-ludicrous Audi RS3. This A35 is one of a burgeoning group of mid-level AMG cars designed to make the entire range a little more accessible to more people. So, excellent cars like the C43 and E53 now have a baby sibling. It’s a promising, if very familiar, German hot hatch recipe: a 2.0-litre 4cyl turbo cranking out 302bhp and 295lb ft connected to all four wheels via a seven-speed dual-clutch gearbox. There are a set of drive modes via a twiddly dial on the steering wheel and certain facets of the car’s handling traits like the traction control, ride firmness (if you spec the £695 adaptive dampers) and how much parp you get out of the sports exhaust can be tweaked by the switchable buttons attached to the wheel, too. There are 18-inch alloys as standard, 19s are optional. What about the cockpit and options list? 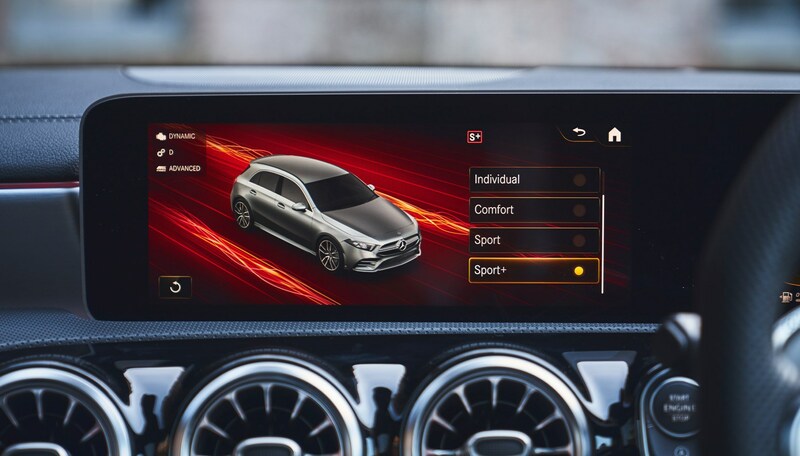 Inside, the A-Class’s MBUX infotainment system is standard with some cool AMG-specific graphics, fat and flat-bottomed steering wheel and the same sports seats from an AMG Line A-Class in the UK. Don’t see that last point as a downside, mind – the AMG 'Performance' seats available on the Continent are flatter and less supportive than a hungover backing singer and become uncomfortable quickly on longer stints. The bit that stings is the options list. Granted, the high-performance version of any car is never a guarantee of having an extensive options list, but some of the A-Class’s best bits will still cost you extra. The larger 10.1-inch twin screens are still going to cost you at least £2395 for the AMG Premium pack, for example. Plus, if you actually want your A35 to be distinguished from someone who’s put a well-specced A180d AMG Line on PCP, you’ll have to fork out another £2595. So, basically, the one you really want is going to cost you £40,670. You could, of course, argue this point for the Golf R, too – a five-door one with the tasty Performance Pack and Akrapovič exhaust additions will make you £40,185 in the wallet. The S3 suffers the same options list inflation. Moving on… how’s the engine? Less soulless than you might think for a 302bhp four-pot turbo. Practically no turbo lag surfaces as you pile on the revs but you hear plenty of whooshing in the mid-range. There’s no kick in the back that might really make some feel a thrill but this engine is quite a weapon – especially since a 4.7sec 0-62mph time makes it faster than a Honda Civic Type R, Hyundai i30 N or Renault Megane RS 300 Trophy, and pretty much on par with a VW Golf R, Audi S3 and BMW M140i. The most entertaining bit is the sports exhaust system. There’s a flap that opens up, with a smidge of bonus fart noise filtering out in Sport. Sport+, meanwhile, is where it gets entertaining with maximum noise and more bangs than popcorn in a microwave on overruns and gearchanges. Makes the hooligan in you smile from ear to ear, and something said hooligans will want to leave switched on at all times. It just never ever stops popping and banging on overruns and gearchanges, instigating childish giggles. It’s fun – like a Golf R that’s let its hair down. We already really like the new A-Class for its sweet-n-neat chassis, so the A35 emphasises some of the regular A’s best bits. 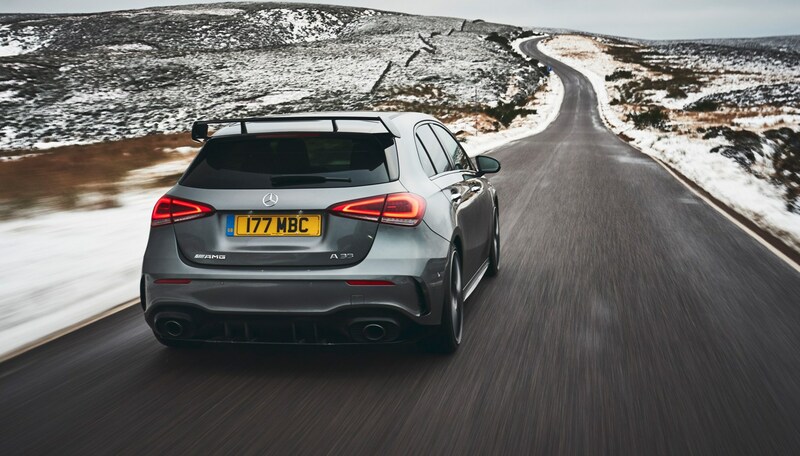 The steering is a particular highlight for the rack’s quick-witted reaction times, delivering real precision – if not quite as communicative as front-driven 300bhp rivals like the Civic Type R or Megane 300 Trophy. The all-wheel drive tech underneath isn’t quite as sophisticated as a Focus RS (may it rest in peace) so uses torque vectoring by braking to curb inside wheel speed instead of a properly trick diff. It really works, though, anchoring the car down if you’re blasting into the realms of ‘silly’ corner entry speeds. 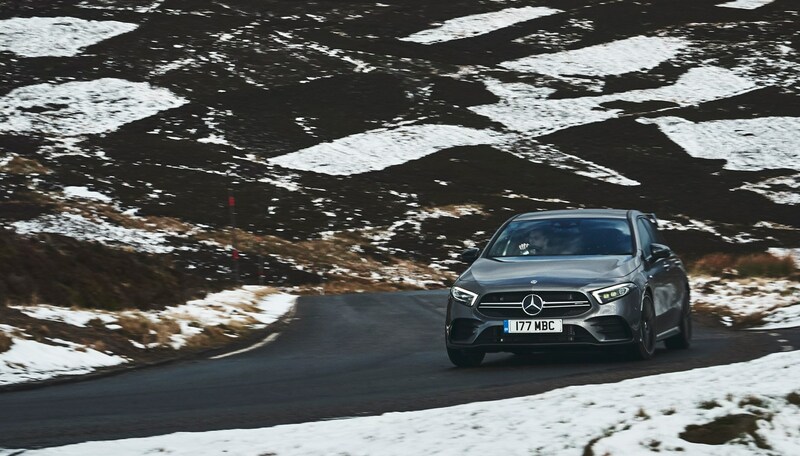 Spec the AMG Ride Control (code for adaptive dampers), as the comfort mode has genuinely impressive damping on ruts and lumps not just in continental Europe but on some of the lumpiest roads we’ve ever experienced in rural Scotland. There’s almost no body roll when you’re rinsing it. It’s also a decent cruiser in Comfort but if you go for the optional 19-inch alloys, there’s quite a lot of tyre roar that echoes through the car at motorway speeds. The AMG-Speedshift dual-clutch’s cog swaps are instantaneous and the manual mode activated by you flicking a paddle remains active for a comfortable amount of time. Merc’s new baby AMG might be considered a ‘half fat’ car in the eyes of the wider Affalterbach range but it’s far from a half fat hot hatch. It’s desirable, faster than plenty of sports cars, grippy in that very planted German way but with just a smidge of theatre that most hot hatch fans will love. We certainly enjoyed it. It won’t thrill like a Civic Type R and it isn’t quite a Focus RS-level hooligan enough for some, but it’ll be just as fast point-to-point and will still slap gigantic a smile on your face. 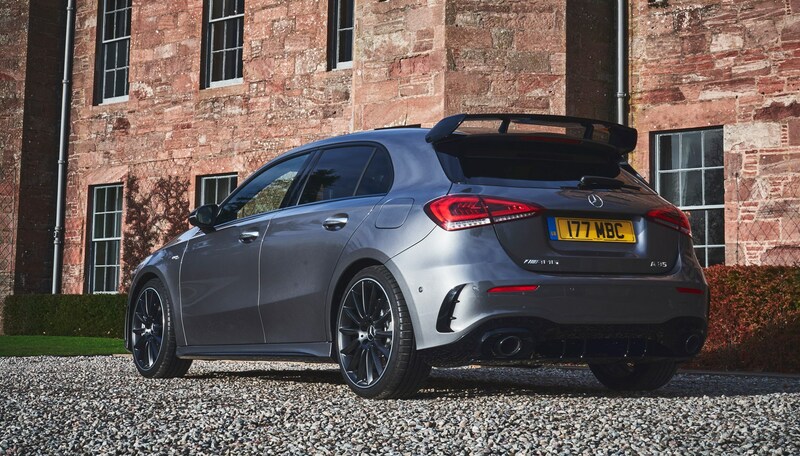 Like other hot German hatches, though, you have to fork out a decent bit extra if you want the A35 at its best, and simply points the finger at the even hotter A45 costing an arm and a leg.